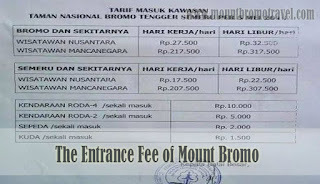 The entrance fee of mount Bromo is different based on the location you enter in. there are four entrance you can choose to reach the village tourism at Bromo Cemoro Lawang, at Village Wonokitri (Pasuruan), from Village Ngadas Overlaping (Malang) and from Village Burno (Lumajang). The major access point is cemoro Lawang. The village of Ngadisari becomes the marks for entrance the national park in Bromo. Prior to park entering, if you drive your car, you will be directed into parking lot at the bottom of mountain. Upon exiting from your car, unless you use the prearranged tour, there are will be person that will approach you to offer ticket for jeep ride to take you to Bromo crater and watch the sunrise. 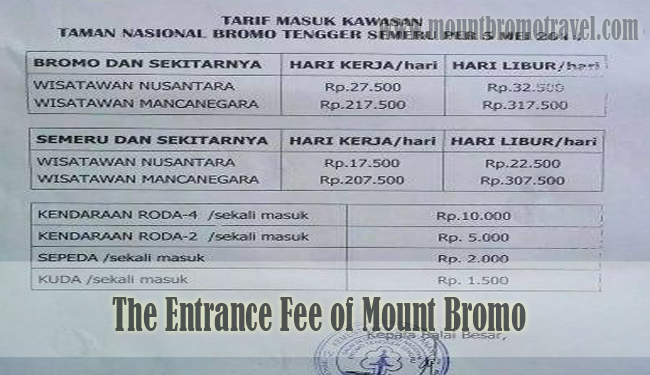 The entrance fee of mount Bromo is different for the domestic and foreign tourist. To go to Bromo, for the domestic tourist, the entrance fee cost Rp.27.500 in weekday and in weekend it increase to Rp.32.500. For the foreigner tourist, it cost about Rp.217,500 in weekday and I weekend it is cost with Rp.317.500. Due to the access and route that far and need transportation, there is transportation rental that available in Mount Bromo. You can choose to rent motorcycle, jeep or car, bicycle, and horse. For renting car, it cost about rp.10.000, motorcycle about 5000, bicycle 2000 and horse rental 10.000. As it is stated before in parking car, you will approach with person that offer you ticket. Be careful because they commonly hike the price and buy the ticket that you can buy directly from the office behind them. Just simply go to the office and ask to purchase a voucher. This will give you more reasonable price. Alternatively, you can walk or take motorcycle taxi. That offer you more negotiable price. Be aware when your tour agency or hotel attempt to collect the park entrance fee at pick up time. The operators have been ask for the free payment before you board your jeep and this will hand you with standard fee paid receipt. The receipt is not entrance ticket. It is will go unchecked at entrance Gate Park as most park staff will cut on the scheme for not checking ticket for specific vehicles. If you do not agree to the practice, refuse to pay and ask to stop at park gate and purchase your ticket. The official The entrance fee of mount Bromo is pink printed paper and it has sequence numbered. After you knew about the entrance fee to Bromo, will you visit to Bromo East Java Indonesia ?